The environmentally-conscious actor and resident of the Hamptons, NY, has recently applied for a wind turbine for his 8+ acre home site. Although a couple of farms and the fire station operate wind turbines in Amagansett, he would be the first homeowner to have one. A public hearing will determine whether or not Mr. Baldwin’s wish will be granted. 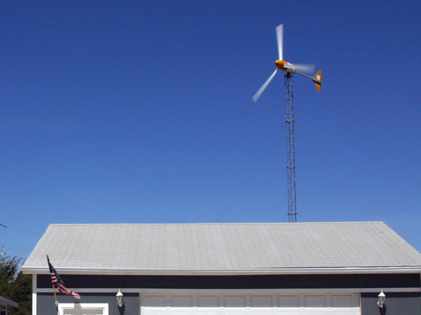 Personally, I would love to know why some people consider modern wind turbines to be eyesores. I think these clean electricity generating machines look cool! According to Newsday, “The town planning department review noted that noise studies on the wind turbine Baldwin wants to erect show that, at a distance of 300 feet in a 25 mph wind, it produces a sound of 54 decibels, while the ambient noise in the same wind is 52.5 decibels. For comparison, a normal conversation at three feet away is measured at 60 to 65 decibels, while a power mower at three feet can exceed 100 decibels.” The suburbs would be a much quieter place if more people used REEL mowers! Read the Small Wind Certification Council’s pdf report on the Bergey Excel 10 wind turbine for all the stats. If you’re concerned about wind turbine bird related deaths, please read the U.S. Fish and Wildlife Service’s Migratory Bird Mortality factsheet (pdf).